Home » AU Exam Timetable , AU NEWS , Educational News , NEWS , others » Anna University Affiliated Colleges Last Date for Odd Semester for UG & PG. Anna University Affiliated Colleges Last Date for Odd Semester for UG & PG. Anna University Announced the ODD Semester Academic Session of the Academic Year 2013 -14 on May 2013. 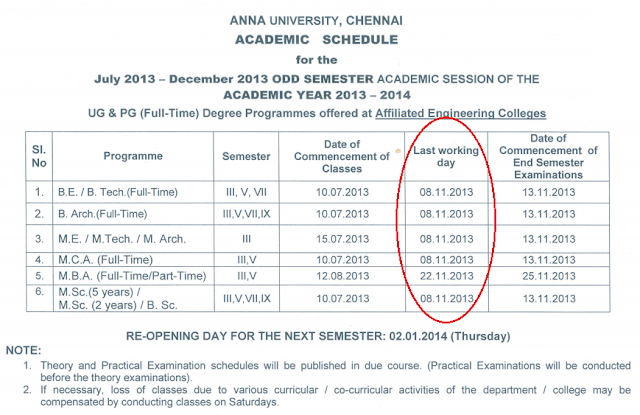 As per that schedule the last date for All UG / PG except MBA is 08.11.2013. Exam Time table already published. Check your Exam Time Table here. So the Last working day may be expect to change slightly based on starting date of Univeristy Practical Exams. 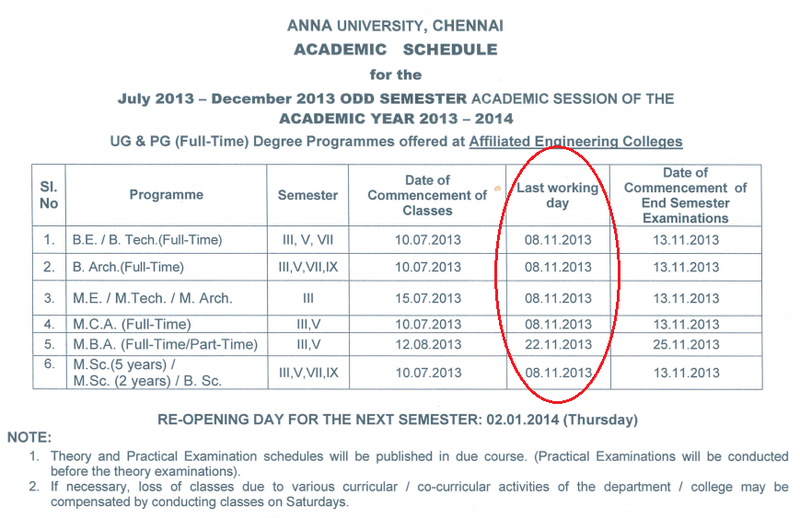 July 2013 - December 2013 Odd Semester Academic Session comes to end on 08.11.2013 for the B.E / B.Tech / B.Arch / B.Sc Students. July 2013 - December 2013 Odd Semester Academic Session comes to end on 08.11.2013 for the M.E / M.Tech / M.Arch / MCA / M.Sc (5 Years) / M.Sc (2 Years) Students. July 2013 - December 2013 Odd Semester Academic Session comes to end on 08.11.2013 for the M.B.A Students.